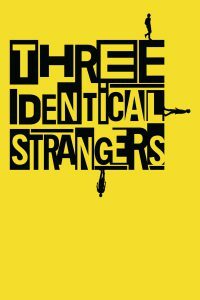 New York, 1980: three complete strangers accidentally discover that they're identical triplets, separated at birth. The 19-year-olds’ joyous reunion catapults them to international fame, but also unlocks an extraordinary and disturbing secret that goes beyond their own lives - and could transform our understanding of human nature forever. Tagline: They didn't know they were brothers. But someone did. Bellmore Movies and Showplace © 2019. All Rights Reserved.